This article originally appeared in the "Together Again "All-school Reunion, July 4, 1987 Souvenir Program. Thanks to Deanna Plemons of the Alumni Association for permission to use this. Early records are somewhat sketchy but most historians agree that by 1820 there was a log building north of the village. All agree that Tera Jones, a surveyor, served as the teacher for about twelve years. This was a subscription school in which each parent paid for his child to attend. William G. Smith, perhaps our first historian, described the early school as being very primitive with paper coverings on the south and west for light. The seats were of rough boards with a wide plank as a common desk. There were very few books used in the building. In 1834 when we became a town, a log public school building was located on the town lot at 4th and Union Streets which had been reserved for a school by the town owners. Sanford Hill served as one of the teachers after James Johnson, William "Yankee" Smith, James Smith and William Taggart. A red brick school building was built in 1848 on the same common school lot. 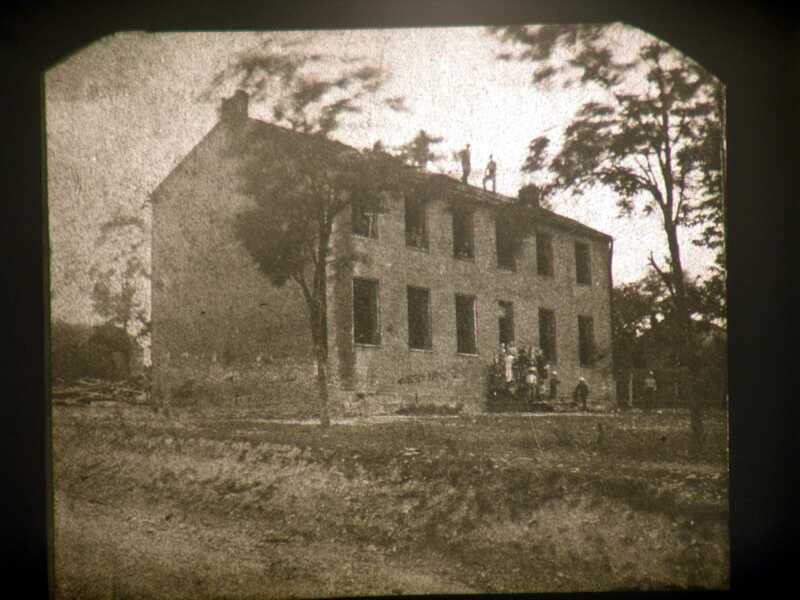 In 1851 a two-story four room school was built. Although it was brick, it apparently was not too well constructed. Reports indicate that teachers would often send students home rather than keep them in the building during a storm. In the 1850's there were 440 students when William C. Orr was Principal. His pay was $30. per month. Jane Gaston, one of the early teachers was paid $8.00 per month. Magic Lantern Glass Slide picture from collection of Dr. Charles H. Birkett. 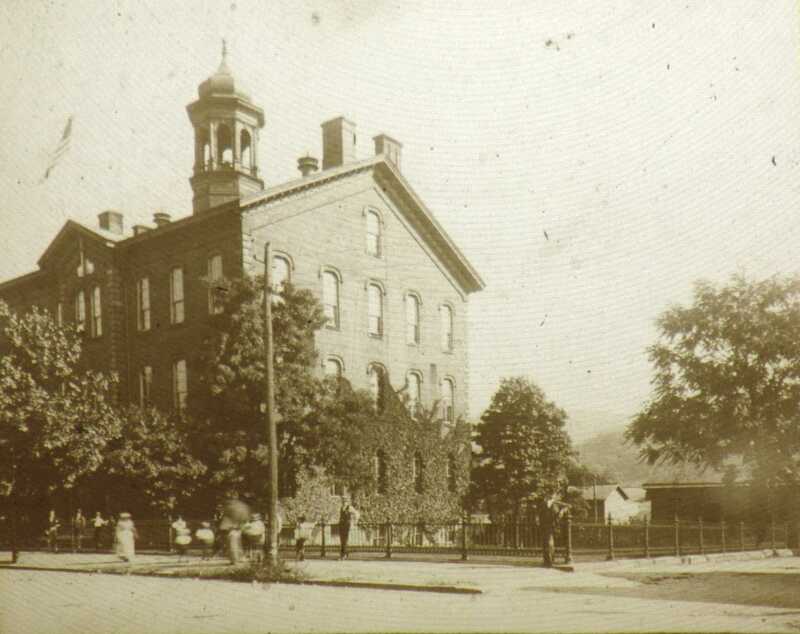 The second school built on the Union and 4th street lot. From 1858 until 1861 when he joined the Union forces in the Civil War, George C. Luckey served as head of the schools. He came back in 1895 to dedicate the new Central School. At that time he was head of the Pittsburgh, Pa. Public Schools. Our first graded school was in 1864. By then there were four teachers under the direction of the superintendent J. P. Cameron who was paid $450. The first Catholic school was established during Civil War days but did not remain open for long. 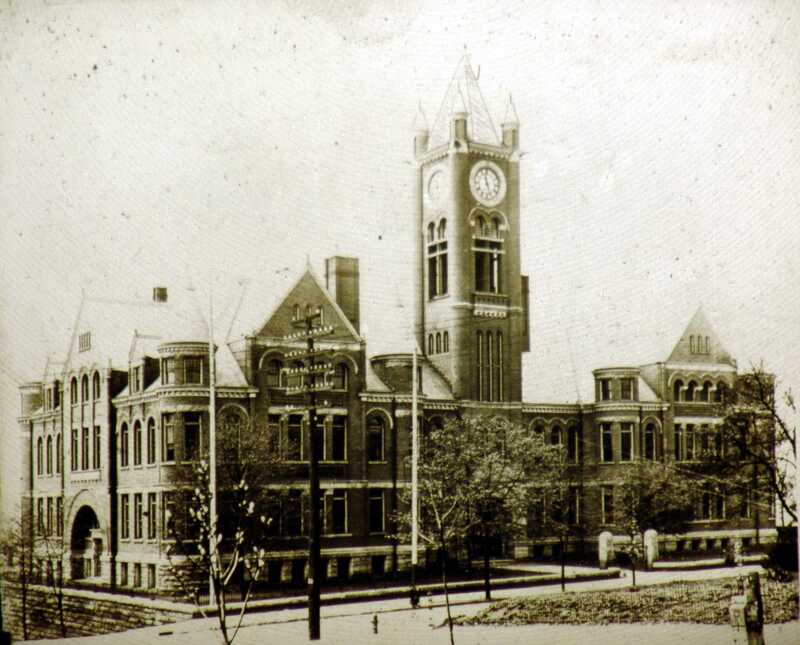 October 17, 1870 was the dedication of our new Union School — a three story building with 10 or some say 12 classrooms and a 04 bell in the tower. One source indicates that the building and the furniture cost $35,000. The superintendent of Schools was T. Jefferson Duncan. Euphemia Huston taught in the upper grades. She later served as Principal of the High School and even completed a term as superintendent after J. Newton George died during the school year. At the November 1870 Teacher's Institute in Lisbon the following resolution was approved: "that lady teachers should receive the same compensation as gentlemen when they perform the same services." Magic Lantern Glass Slide picture from collection of Dr. Charles H. Birkett. The third school built on the Union and 4th street lot. Magic Lantern Glass Slide picture from collection of Dr. Charles H. Birkett. 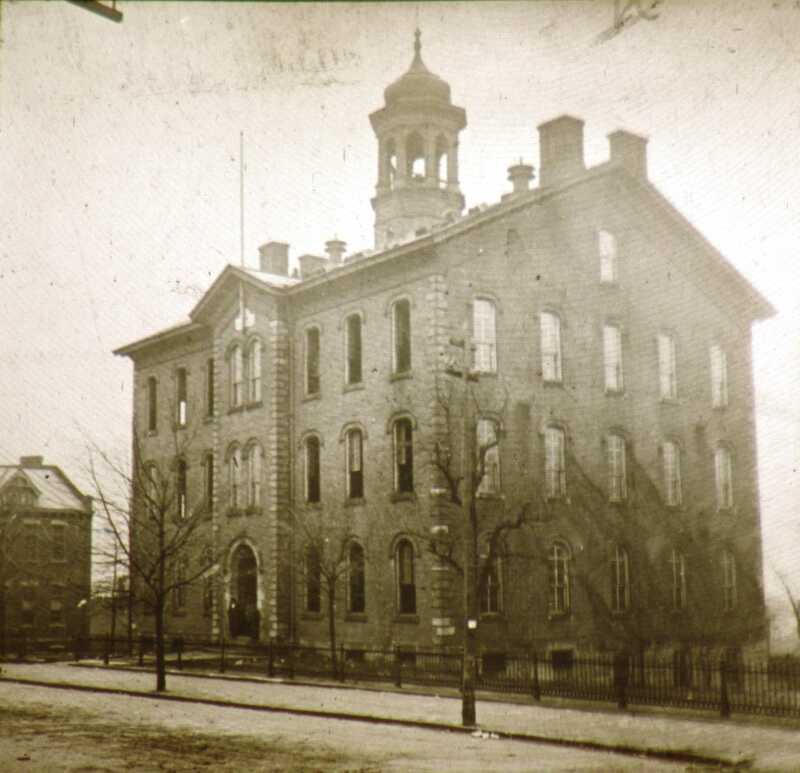 The Central Building, the fourth school built on the Union and 4th street lot. Magic Lantern Glass Slide picture from collection of Dr. Charles H. Birkett. 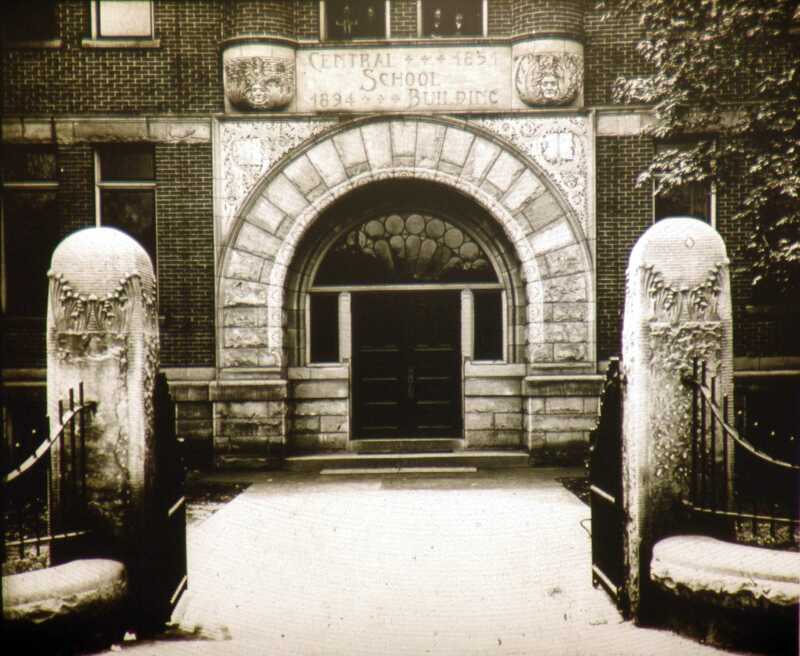 The entrance to Central Building.